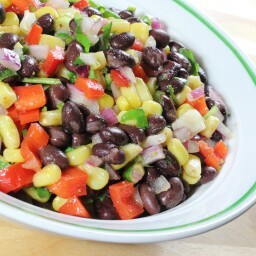 Zesty Black Bean & Corn Salad - Cold Salads - Recipes - Frank's Recipes! I love to serve this refreshing salad alongside Mexican dishes, grilled steak or even as a nice side to hamburgers. Whisk together the oil, Tabasco sauce, & vinegar. Add in all of the remaining ingredients and stir gently to coat. Refrigerate for 1 hour prior to serving. This side salad should be served cold.